Base of Operations: Mobile; lives in a houseboat. Powers/Abilities: Genius gadgeteer, skilled in most sciences and able to improvise equipment from pretty much anything. History: Angus MacGyver was born on the 23 March 1951, and raised in Mission City, Missouri. His father and grandmother died in automobile accident when he was a boy (on the 14 Dec 1962 to be exact), leaving him to be raised by his grandfather, who taught young "Mac" (as he likes to be called) the value of fair play. Early on, Mac gained a intense dislike of guns after the accidental shooting death of his friend Jesse, and for the rest of his life he refused to use them, no matter what the circumstances. Mac's grandfather, Harry Jackson (played by John Anderson) disappeared from the MacGyver household in 1969. Mac graduated Western Tech and moved to California. While there he met then DXS operative Pete Thornton. Thornton (played by Dana Elcar) recruited Mac into the DXS. During a mission overseas, Mac's mother died from complications of a stroke. These incidents built a fear of romantic commitment into Mac, causing him to feel that the women that got close to him would suffer. The various jobs that Mac held prior to the DXS made him a talented field operative. (The DXS is somewhat like the CIA.) Eventually, Pete Thornton left the DXS to act as Director of Operations for the Phoenix Foundation. (The Phoenix Foundation is an entirely benevolent organization, with activities like diplomatic relations, environmental studies, technological innovations and conservation efforts. ), and Mac moved to that agency with him. It was during this time that Mac more frequently had run-in's with the HIT operative Murdoc. Since first becoming aware of Murdoc in 1975, Mac had thought that he seen him die on a number of occasions. He seemingly cheated death each time. Murdoc describes his employers as " the international murder incorporated" and himself as "quick, neat and untraceable." Murdoc was played by sometime musician Michael Des Barres. Mac settled down some and got a semi- regular girlfriend, Penny Parker (played by Teri Hatcher) and volunteered at a Boy's and Girls Club called the Challenger Club. He went undercover at one point as Dexter Fillmore. His grandfather came back into his life for a time. (The actor that portrayed him died in 1992.) Shortly thereafter, Mac discovered that he had a son by photojournalist Kate Malloy, whom he had dated just after his college years. His son's name was Sean Malloy, but he liked to be called Sam. In the end of the series, MacGyver left with his son on a motorcycle trip. Comments: Played by Richard Dean Anderson. The show ran from 1985 to 1992, a total of seven seasons, 139 episodes and two TV movies. 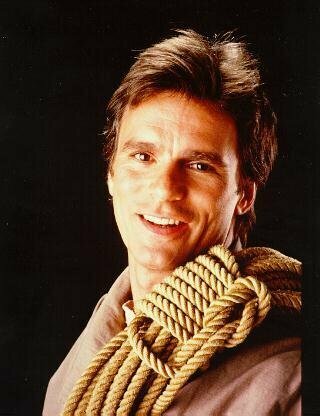 There was some mention of MacGyver at one point being a special forces operative, but this was glossed over by the producers as it did not fit with the scheme of the character. MacGyver was created by Lee David Zlotoff. A new series featuring Angus' nephew Clay debuted in 2003, entitled Young MacGyver. Although the character's first name was given in the series as being Angus, in the pilot and the press kits, he is referred to as "Stace". This proved to be erroneous. In 1991, the actor that portrayed Pete Thornton was diagnosed with glaucoma, a degenerative vision condition. This was reflected in the show, as Pete Thornton was diagnosed with it as well. Many thanks to Josh Geren for his extensive, in-depth write-up of this character that provided most of the information above. Thanks to Jolene McConnell for reminding me of Nicodemus Legend. Colonel Jack O'Neill of SG-1, who bears an uncanny resemblance to him. Nicodemus Legend, inventor from the Wild West, who also bears a startling resemblance.